Biosurfactants with the ability to replace harmful petroleum based surfactants in everyday products are a step closer to becoming the norm. 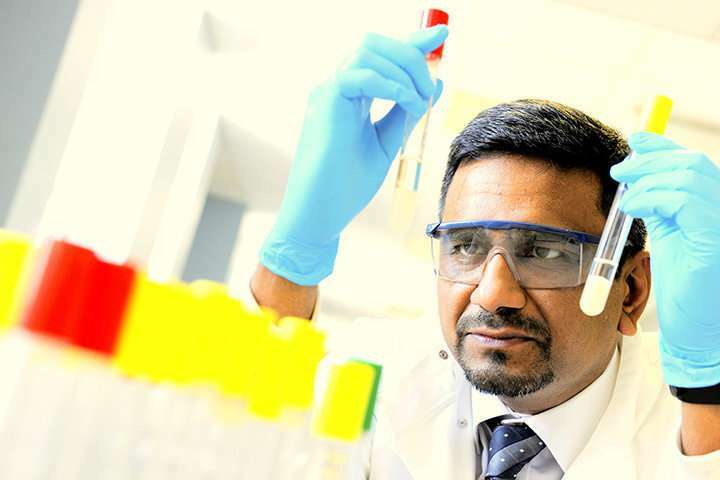 Dr. Pattanathu Rahman from the Institute of Biological and Biomedical Sciences at the University of Portsmouth and Dr. Claudio Angione from Teesside University have received follow-on funding to explore the future commercial potential of biosurfactants. Surfactants are the main active ingredient in most cleaning products and help to "wet" the surface and emulsify oils and fats. Most surfactants used in products are typically petroleum based and can cause skin irritation and allergies. That's where biosurfactants come in. Biosurfactants are derived from biotechnology and are produced by living cells such as bacteria and have antimicrobial properties. These properties prevent the growth of skin bacteria responsible for odour. Adding biosurfactants into products, such as deodorants, may help control the bacteria and combat unpleasant odour. Biosurfactants are also biodegradable, non-toxic and organic, making them considerably better for the environment than petrosurfacants and have the ability to replace traditional surfactants in many everyday products including cosmetics and household products and even in fast-food. Dr. Rahman and Dr. Angione received the follow-on funding from the Biotechnology and Biology Sciences Research Council (BBSRC) which encourages collaboration between academia, industry, policy makers and NGOs in order to tackle research challenges. The funding will also allow them to kickstart a collaboration with TeeGene Biotech Ltd. to work towards practical application of their research. Dr. Rahman said: "It's a very exciting technology with tremendous potential for applications in a range of industries. Biosurfactants can be manufactured in a laboratory, are fully biodegradable and have minimal impact upon the environment, making them much more economical and efficient." Dr. Rahman's previous research into biosurfactants has also been recognised by L'Oreal in a recent patent for cosmetic use of biosurfactants as an active agent in deodorant. Dr. Rahman has also had a journal published recently into the metabolic capabilities for biosurfactant production by PeerJ.